So, let's keep real! We ALL know I wear wigs, weaves and everything in between! 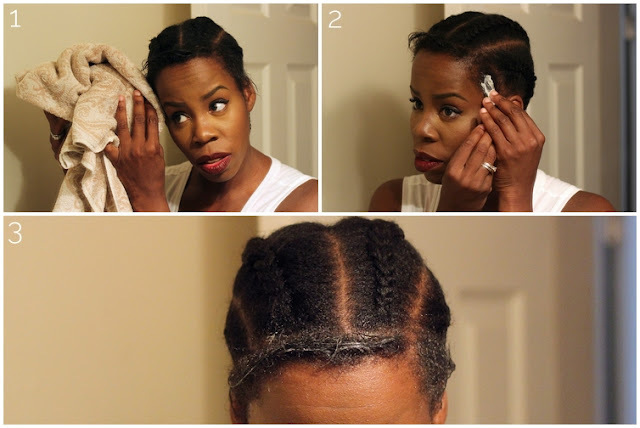 They are the holy grail to prevent so much manipulation against my real hair. But even with wearing styles to protect my hair, there are still some areas of major concern, i,e, my edge line! Oh, the dreaded edge line! For me, it's been through major ups and downs over the years. I wasn't blessed with a full, thick head of locks, so the maintenance of my edges is (I would say) twice as hard as the norm. But that's where my new love for SheaMoisture comes comes into play! 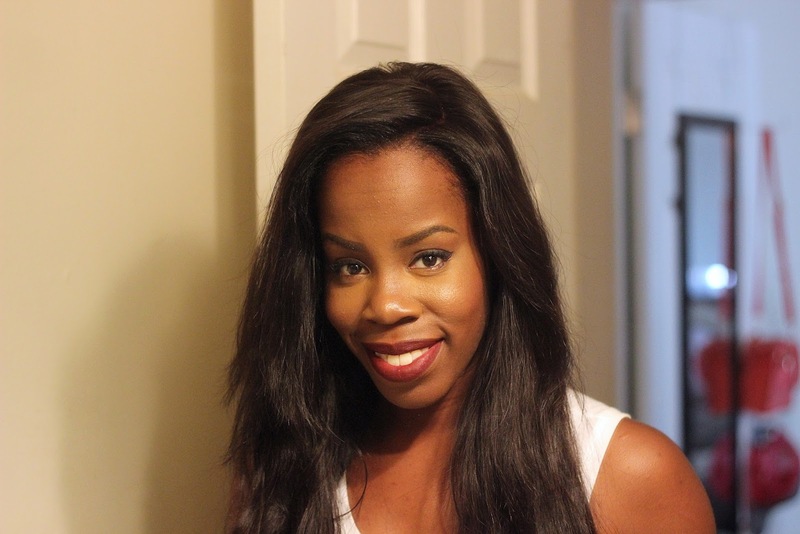 I was recently asked by SheaMoisture to share some of my hair woes and how simply using the right products can get problem areas back on the road to recovery! The great thing is how affordable they are! I stopped by my local WalMart to pick up a few items that I think will be a healthy recipe for my hair. We all know WalMart for having competitive pricing and it was the same for the SheaMoisture Collections! You can find all of their products in the general hair care aisle of the store! 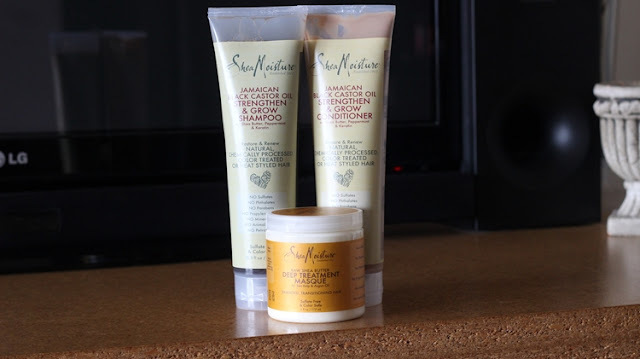 Now with so much to choose from in the SheaMoisture collection (kid in a candy store), I had to really sit down and think about what my hair needs at this moment and what makes it thrive! My hair gets VERY dry and with that comes brittle, weak strands. I knew that I needed something for a deep moisturizing and something that was going to rebuild strength, so I went with the Jamaican Black Castor Oil Strengthen & Grow Shampoo and Conditioner in the 10.3 oz. tubes and the Raw Shea Butter Deep Treatment Masque in the 6 oz. jar. They have different size options based off of your needs. My son and I got in out fitness for the day by biking to and from our local WalMart (hence the workout gear), so after arriving back home and showering, I threw on some makeup so I wouldn't scare you guys, lol! Today was re-braid day (I normally just remove the braids under my wig and re-braid weekly because I sleep rough and I hate when it's poofy). I'm not washing until next week, where I will try out my Jamaican Black Castor Oil Shampoo and Conditioner, but this week was all about edge maintenance. 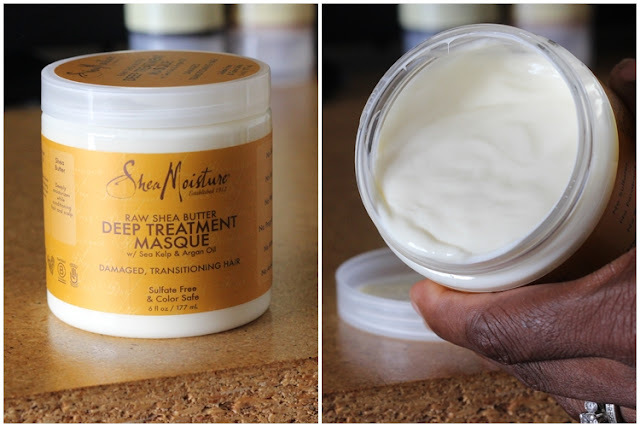 So, let's get off into this Raw Shea Butter Deep Treatment Masque. It's featured ingredients are Sea Kelp, which is mineral-rich nutrition that seals and smoothes hair cuticles, Argan Oil, which is used to restore shine while helping promote hair elasticity and Shea Butter, which deeply moisturizes while conditioning hair and scalp. It's also Sulfate Free and color safe! 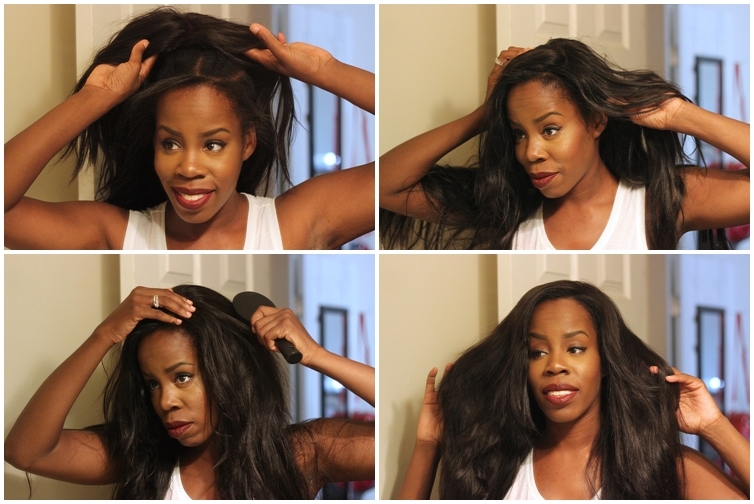 This product is great for damaged or transitioning hair. 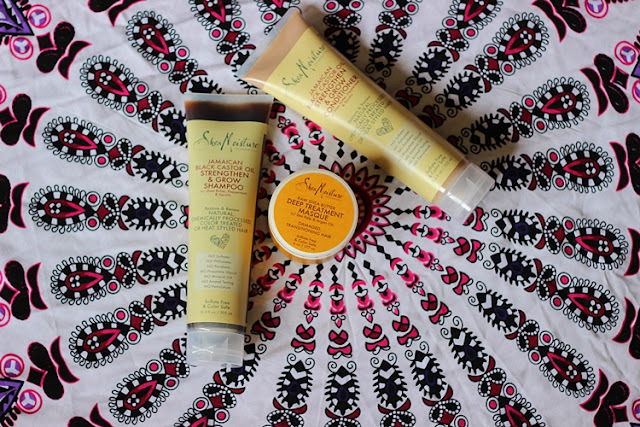 Another awesome feature is that SheaMoisture’s Shea Butter is purchased from women-run cooperatives in Northern Ghana at a fair wage premium. Check it out here - Love of our World! Extremely stoked that SheaMoisture is made with Natural and Certified Organic Ingredients and their products can be used in a variety of hair cocktails, like the one I concocted. So in following the instructions, I applied the masque to damp hair (it called for freshly washed hair, but I don't use anything but Olive Oil for the initial press once a week, so it wasn't dirty, I'll wash next week) and let it sit for 5 minutes. 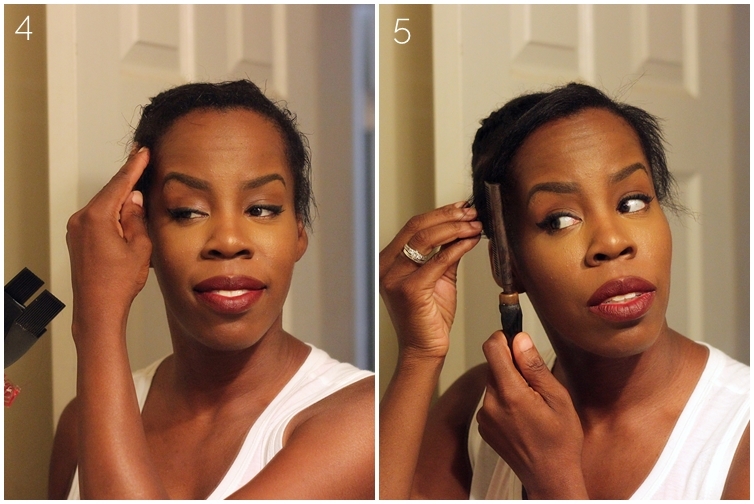 At first, I didn't think that 5 minutes was going to be enough, but I wanted to give the instructions a try and next time, I'll deep condition for maybe 20-30 mins. ...and added my (completely unstyled) wig back to see how it blended! I have to say that for the first time using this Raw Shea Butter Deep Masque Treatment, I am really impressed! I honestly didn't think 5 minutes was going to be enough to leave my edge line feeling as nourished as it did! 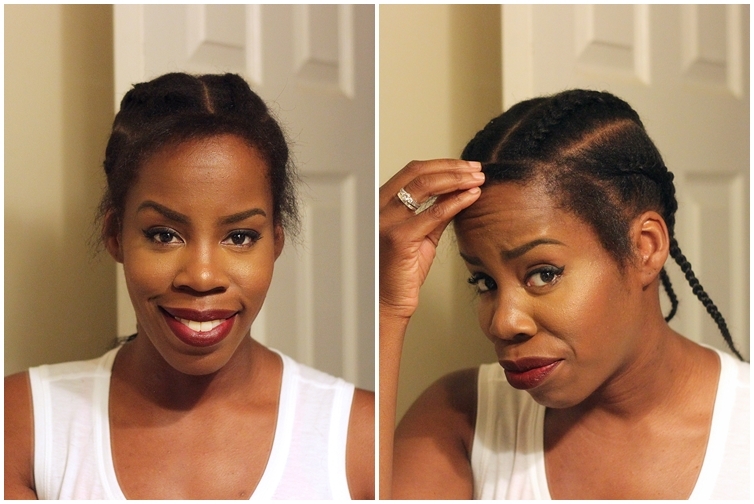 If 5 minutes did that much justice, just wait until wash day when I can deep condition for a half hour! My hair is going to feel like Fabio's hair riding on that white horse down the beach!! LOL! Fingers crossed that I can come back with a successful update in a few months!